Egypt’s political parties have heaped praise on the government’s policy statement delivered by Prime Minister Mustafa Madbouli before parliament this week. Most high-profile MPs and politicians interviewed by Al-Ahram Weekly said Madbouli’s insistence that Egypt’s political life should be revitalised in the coming stage was highly impressive. They also agreed that Madbouli’s announcement that 85 per cent of Egypt’s IMF-inspired economic reform programme has been accomplished sends a good-news message to citizens, especially the poor and those of limited income who have suffered from harsh austerity measures and high prices since 2016. Madbouli presented his newly-appointed government’s policy statement in parliament on Tuesday, as per the country’s constitution, highlighting his cabinet’s policy priorities. Madbouli and his cabinet were sworn in by President Abdel-Fattah Al-Sisi on 14 June, replacing the cabinet of former prime minister Sherif Ismail who resigned earlier this month. Madbouli said during his 20-minute speech to a full parliamentary session that his government will focus on five areas of work in the coming stage. “We aim to reinforce Egypt’s national security, implement intensive social protection programmes, boost economic development, raise productivity rates, and improve the standard of living of poor citizens,” Madbouli said. “We will create a job for every poor citizen as long as he is able to work, but if he is living below the poverty line and it’s hard for him to work, we will do our best to care for him,” said Madbouli, revealing that “all social protection programmes will be unified in the coming stage into the Mutual Support and Dignity programme which offers LE20 billion every year in financial help to around 18 million citizens across Egypt”. On improving living standards, Madbouli said the cabinet’s plan is to build a total of 1.1 million residential units, upgrade traffic rules, improve transportation services, and establish new sanitation networks among many other services. Madbouli will keep the housing portfolio he oversaw in Ismail’s cabinet. He, however, cautioned that the results will not be felt if the current rate of population growth persists, explaining that the cabinet will work on family planning awareness and a birth control campaign with a total funding of LE250 million. “So, this campaign — Two is enough — aims to cover one million women in Upper Egypt,” Madbouli said. Abdel-Aal said parliament will meet again on 15 July to discuss the report on the government’s policy statement. “At the end of the debate, the government will face a vote of confidence in line with Article 146 of the constitution which stipulates that a newly appointed prime minister must deliver a policy statement before parliament, after which MPs should vote on the policy, in a process that ends within 30 days of the formation of the government,” Abdel-Aal said. Bahaa Abu Shoka, head of the liberal Wafd Party, said he was impressed by what Madbouli said about revitalising political life. “I hope that there will be a national dialogue between the government and political parties very soon, with the objective of achieving this highly important objective,” Abu Shoka said. Abu Shoka said the Wafd agrees that “the security challenges Egypt faced in the last four years made its political life very weak. It is good that the new prime minister admitted that politics in Egypt needs a new breath of life, and that there should be a national dialogue on this vital issue,” said Abu Shoka. 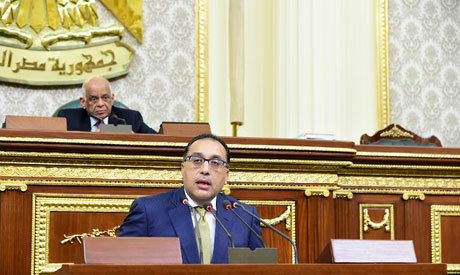 Agreeing, Ayman Abul-Ela, parliamentary spokesman of the liberal Free Egyptians Party, said “there is a consensus in parliament that Egypt’s political life is in urgent need of a boost.” “We have seen how political parties were not able to field a candidate in Egypt’s 2018 presidential election,” said Abul-Ela, adding that “the coming stage should focus on amending laws regulating the performance of political parties, and the election of local councils and parliament. The laws should be changed to ensure that the majority of members of parliament and local councils are party-based and not independents,” said Abul-Ela.